Some of the most common home styles today date back to many centuries ago. One such style is Greek Revival. Featuring columns, light colors and artistic trimming, a Greek Revival home can instantly make you feel like you’ve been transported back in time to ancient Greece. Bradford Exteriors, the leading roofing company, discusses how you can achieve this look for your home. A Greek Revival home should feature large double-hung windows with six panes in each sash. You can also choose a decorative window style with three-part assemblage. The windows in a Greek Revival home should complement the entry doorway rather than being a focal point themselves. You have some flexibility when it comes to designing the entryway, since the Greek Revival style can accommodate both single and double doors. One thing you should incorporate is a wide, heavy trim on your door frame. Ideally, Greek Revival homes should have a low-pitched gable and hip roof with a wide trim cornice line. This is necessary to emphasize the temple-like roof. Your roofer can install either standing seam tin or cedar shingles as the roofing materials. The Classical Greek period is characterized by a rigorous attention to detail when it comes to architecture. To achieve architectural authenticity, consider embellishing your home with the types of simple moldings that were common during the classical era. 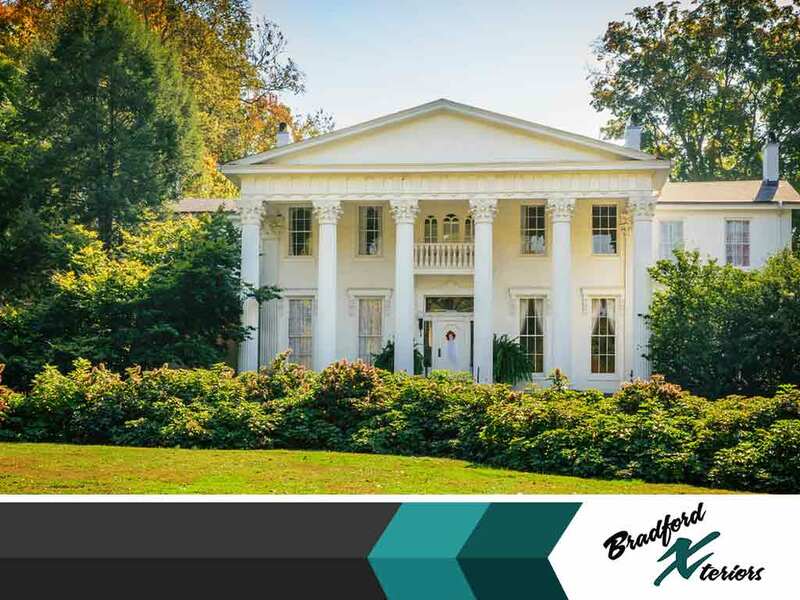 Your home’s exterior finish should be stucco, wood or stone, the essential materials used in creating a Greek Revival appeal. You can ask your trusted siding installation company, Bradford Exteriors, to make this happen. Entrust your complete house renovation to the experts from Bradford Exteriors. We’re the one-stop shop you need for exceptional home improvement services at competitive rates. Call us at (614) 328-8188 or fill out our contact form to receive a free project estimate. We serve homeowners in Columbus, Arlington and Dublin, OH.